Cyclones form in most of the Earth’s oceans; depending on where you live, they are known by different names. Hurricane – North Atlantic Ocean and Northeast Pacific Ocean, east of the International Dateline. Typhoon – North Pacific Ocean, west of the International Dateline. Tropical Cyclone – Southwest Pacific Ocean west of 150 Degrees East, and Southeast Indian Ocean. Kublai Khan’s first invasion of Japan was foiled by a typhoon. Hindu temple records claim that a violent storm broke a natural isthmus that previously joined Sri Lanka to India. The first written European account of a hurricane comes from Christopher Columbus, who sheltered his fleet from a tropical cyclone during his second voyage to the New World. He later declared that -nothing but the service of God and the extension of the monarchy- would induce him to expose himself to such danger again. How prophetic. During his fourth voyage, Christopher Columbus warned the governor of Hispanola, Nicholas de Ovando, of an approaching hurricane. The governor ignored Columbus- warning, refused his request to stay in port at Santo Domingo, and ordered 30 ships from his treasure fleet to set sail back to Spain. Two days later the storm stuck in Mona Passage, between Hispanola and Puerto Rico, sinking 21 of those ships. Five hundred sailors perished. The first attempt by the Spanish to colonize Florida ended when 73 of 74 ships in the fleet were destroyed by a hurricane. The surviving ship and its sailors founded a colony in present-day Pensacola Bay. A French fleet sent to support Fort Caroline, and take control of the Atlantic coast of North America, is destroyed by a hurricane. As a result, the Spaniards at St. Augustine massacred the colonists at Fort Caroline, gaining control of East Florida, near present-day Jacksonville. The British ship Sea Venture, bound for Virginia to relieve the starving Jamestown colonists, was crippled by a hurricane and wrecked on the uninhabited Bermuda. The survivors establish a British colony. The story becomes the inspiration for William Shakespeare-s The Tempest. Fifteen years after the Mayflower landed at Plymouth Rock, the Great Colonial Hurricane struck a Massachusetts Bay Colony. The eye passed between Boston and Plymouth, causing a twenty-foot tide in Boston. Many of the pilgrims believed that the storm was apocalyptic. A rare hurricane strikes England, killing some 8,000 people. Daniel Defoe publishes The Storm from eyewitness accounts. A Spanish treasure fleet sailing from Cuba to Spain is destroyed in a hurricane off the coast of Florida. Modern day treasure hunters are still searching for millions of dollars lost in solid gold. Benjamin Franklin’s plan to study a lunar eclipse from his location in Philadelphia was prevented when a hurricane struck the Northeastern United States. He soon learned that his brother, residing in Boston, experienced the same storm, but much later. This led Franklin to the conclusion that the storm had moved up the Atlantic seaboard, against the direction of the surface winds. This observation gave rise to the first scientific steps toward a basic understanding of hurricanes. In addition, Professor Winthrop of Harvard made his first detailed pressure and tide measurements during this hurricane. Willoughby Spit was created in Norfolk, Virginia when a hurricane destroyed Fort George, the site of present day Fort Monroe. An eight hundred acre sand spit was washed up by the storm. A seventeen foot storm surge, from an Atlantic hurricane, destroyed Charleston, South Carolina-s infrastructure and over 500 homes. A powerful hurricane hit Martinique and Pointe-a-Pitre Bay, Guadeloupe killing more than 6,000 people. A central Atlantic hurricane claims the lives of more than 3,000 people. A hurricane hits western Cuba killing more than 3,000 people. A powerful hurricane hit Dominica and Martinique causing 3,000 deaths. The cyclone then moved south of Jamaica. The Great September Gale, the first hurricane to strike New England in 180 years, first made landfall on Long Island, New York, and then Connecticut. It brought an eleven-foot storm surge to Providence, Rhode Island causing extensive damage throughout the region. A category 4 hurricane struck Cape May, New Jersey, with hurricane force winds traveling as far west as Philadelphia, cutting a path of destruction. The Racer’s Storm hurricane was one of the most destructive storms of the 19thcentury. It devastated much of the Gulf Coast of Texas before moving through Louisiana, Mississippi, Alabama, Georgia, South Carolina, and finally arriving off the coast of North Carolina on October 9th. Two major inlets in North Carolina were cut by this September hurricane, referred to as -The Great.- Later that year, a category 5 hurricane struck the Florida Keys, destroying or damaging all but eight of the 600 homes in Key West. Two hurricanes hit Fort Brooke, present day Tampa Bay, within one month of each other, nearly destroying the town. A cyclone kills about 60,000 people in Calcutta, India. A hurricane struck the Southern Coast of Cuba, as predicted by Father Benito Vi-es, his first hurricane warning. Father Benito Vi-es studies of tropical storms and hurricanes made the Cuban forecasters some of the best in the world at that time. A hurricane and resulting storm surge struck the Meghna River region in present day Bangladesh killing more than 100,000 people. The resultant disease claimed an additional 100,000 lives. Seven hundred people were killed with a hurricane hit Savannah and Augusta, Georgia. Several barrier islands were completely submerged by the storm surge. Indianola, the leading port city in Texas, was destroyed by a hurricane that had already dumped more than twenty-one inches of rain on Alexandria, Louisiana. Indianola was never rebuilt. Sea traffic was diverted to Galveston, making that city the prominent port until it was also destroyed by the Great Hurricane of 1900. On August 27, 1893, a category 3 hurricane struck Savannah, Georgia and submerged the Sea Islands in South Carolina killing more than 2,000 people, and leaving more than 30,000 homeless. In October, another storm flooded a Louisiana bayou, killing more than 2,000 people. Hurricane San Ciriaco strikes Puerto Rico, leaving 3,433 people dead and causing millions of dollars in damage. Cyclone Mahina, a category 5 cyclone, strikes Bathurst Bay , Australia, bringing with it a 48 foot storm surge, and leaving over 400 people dead. The deadliest natural disaster in United States history, this category 4 hurricane moved through Cuba into the Gulf of Mexico before crashing into Galveston, Texas without warning. The storm brought tides as high as fifteen-feet killing an estimated eight-to-twelve-thousand people. The cost of damage was 20 million dollars. In today-s money, that would equate to 700 million dollars. A hurricane strikes Cuba, the Florida Keys, and Texas with a storm surge of up to twelve-feet. It was estimated that as many as 900 people perished. As Miami neared the end of its first boom period, with the extension of the Florida East coast Railway, a category 4 hurricane struck with little warning. The 128 miles winds brought a 15-foot high storm surge caused 150 million dollars in damage (1.7 billion in today-s dollars), and taking the lives of 350 people. The devastation led to the first building code development in Miami, which was imitated in over 5000 cities nationwide. The San Felipe / Lake Okeechobee hurricane hit Puerto Rico on September 13th and continued through the Bahamas until it came ashore near Palm Beach, Florida on September 16th. The hurricane continued to cut a path inland over the north shore of Lake Okeechobee, causing a lake surge of nine-feet that drown the entire area. Some 2,500 people perished in Puerto Rico and Florida combined. The damage was estimated at 25 million dollars (300 million in 1990 U.S. dollars). This hurricane now ranks behind Galveston as the second deadliest natural disaster in United States history. As many as eight-thousand people were left dead in Santo Domingo, Dominican Republic as this hurricane ripped through the capital city. A category 5 hurricane strikes Cuba leaving more that 3,000 dead and causing millions of dollars in damage. This was a very active year for tropical storms and hurricanes. Twenty-one named storms are on record, including the category 4, Great Chesapeake Hurricane, which caused 27.2 million dollars in damage (358.4 million in 2005 U.S. dollars), and claimed 30 lives. Virginia was hardest hit with the center of circulation passing directly over Norfolk. A Central America hurricane traveled over the Yucatan Peninsula before making landfall in Louisiana. Up to 3,000 people were killed with more than 2 million dollars in damage to Louisiana. The most powerful hurricane to make landfall in the United States occurred on Labor Day when a category 5 storm crashed into the Florida Keys before turning north to the southeastern United States. The 180 mph winds and rushing tides claimed the lives of 408 people, mostly WWI veterans working in the area. With little warning, the – Long Island Express – a category 3 hurricane, slammed into New York’s little island before ripping through southern New England in less than six hours. There were 600 fatalities. The Great Hurricane of September, 1944 is largely forgotten in light of the previous two mentioned here. This is likely due to the fact that the worst effects were experienced at sea. Five ships, including a United States Navy destroyer and minesweeper, two United States coast Guard cutters, and a light vessel were sunk by the storm, causing 344 deaths. The powerful storm caused extensive damage from North Carolina all the way to New England estimated at 100 million dollars. In 1946, the United States Navy and Air Force organize Hurricane Hunter squadrons in the Pacific and Atlantic. In 1947, Navy planes begin seeding an Atlantic hurricane as part of Project Cirrus. The hypothesis of storm seeding originates from Dr. Irwin Langmuir, who explored the idea that if a plane flew into the eye of a hurricane, and dropped a payload of dry ice, or silver iodide aerosols, the hurricane would form rain, and thus weaken its wind strength. Unfortunately, the experiment failed. It has since been determined that hurricane force winds already contain an abundance of ice crystals, required to produce rain, and are beyond the control of mankind. In 1950, the United States Weather Bureau officially begins naming hurricanes. September 1950 – Hurricane Easy sustains winds at 125 mph and dumps more than 38 inches of rain of Yankeetown, Florida. October 1950 – Hurricane King hits Miami carving a 10 mile path of destruction with gusts reaching 150 mph and a storm surge as high as 19 feet. August 1953 – Hurricane Barbara ravages the Carolinas with gusts of 90 mph, causing damage over 1 million dollars and claiming one life. September 1954 – Hurricane Carol hits North Carolina with winds up to 100 mph and damage of 250,000 dollars. September 1954 – Hurricane Edna nips at the heels of Carol causing damage to New England exceeding 40 million dollars. Twenty-one people perished. October 1954 – Hurricane Hazel, a category 4 storm, strikes North Carolina and brings hurricane force winds as far as Canada. Hazel also brings a record eighteen-foot storm surge at Calabash, North Carolina. Wind gusts of 150 mph were recorded as Hazel carved a path of destruction that cost more than 350 million dollars and left over 600 people dead. August 1955 – Hurricane Connie was the first of three hurricanes to wreak havoc on the Carolina-s that year. Connie produced heavy rains, tornadoes, and wind gusts up to 100 mph, affecting North Carolina, Eastern Pennsylvania, Delaware, New Jersey and New York City. The storm caused devastating floods and claimed the lives of 155 people. August 1955 – On the heels of Hurricane Connie, just five days later, Diane made landfall along the outer banks of North Carolina. Diane was the first billion dollar hurricane to make landfall in the United States. At her peak, Diane produced winds of 125 mph. Her flooding rains proved more devastating, killing 200 people. It was Hurricane Diane that brought about a Presidential Commission on Storm Modification that eventually led to Project Stormfury (1963), another failed attempt to seed hurricanes. September 1955 – Hurricane Ione struck just one month after Connie and Diane, which fortunately made landfall well after it had reached peak intensity. Even so, it brought sixteen-inches of rainfall to parts of North Carolina, 90 million dollars in damage, and left six dead before turning seaward. September 1958 – Hurricane Helene was one of the most powerful hurricanes of the 1950-s. Thankfully, she spared the Carolina-s, but just barely. Helene raged just 20 miles off the coast of Cape Fear with winds whipping at 135 mph. In 1955, the Miami office of the United States Weather Bureau is designated the primary hurricane warning center responsible for coordinating all forecasting and warnings issued for hurricanes in the Atlantic. The U.S. Weather Bureau founds the National Hurricane Research Project (NHRP) which begins research flights into hurricanes the next year. In 1959, the Joint Typhoon warning Center is formed in Guam, combining itself with the Navy and Air Force forecasting efforts. In 1960, TIROS I, the first experimental weather satellite is launched, and promptly discovers an undetected tropical cyclone near New Zealand. Summer 1960 – Hurricane Donna sliced an erratic path from the Caribbean, through the Florida Keys, into the Gulf of Mexico, back to and over Florida before heading up the Atlantic coast to North Carolina, New England, and completing her journey at Long Island, New York. Her peak winds of 200 mph and 13-foot storm surge claimed the lives of 50 people while causing more than one billion dollars in damage. September 1961 – Hurricane Carla, the most powerful storm to strike Texas in more than 40 years, brought winds of 170 mph, storm surge waves of at least eighteen-feet, and caused 408 million dollars in damage, killing 43 people. October 1961 – The wicked witch of this Halloween, Hurricane Hattie, struck the capital of Belize as a category 5 leaving some 275 dead in her path, causing 60 million dollars in damage, and causing the government of Belize City to relocate its government offices inland to Belmopan. September 1963 – Hurricane Flora became a category 4 storm just before making landfall on southwestern Haiti then drifting westward through Cuba. Flora was responsible for 8000 fatalities and billions of dollars in damage. August 1964 – Hurricane Cleo produced winds gusts of 138 mph, caused 125 million dollars in damage, but thankfully did not claim any lives. September 1964 – Hurricane Dora swept through the Northeastern coast of Florida, just weeks after Cleo had subsided, with wind gusts of 125 mph and a twelve-foot storm surge. September 1965 – Hurricane Betsy, a category 3 storm, struck southern Florida and Louisiana. This area of the United States will enjoy relative calmness before the devastating storm of Andrew in 1992. October 1966 -Hurricane Inez, also known as -The Crazy One,- carves it-s category 3, 190 mph path, from the Caribbean to Florida, and then to Mexico, producing millions of dollars of damage and claiming the lives of 1,500 people. April 1968 – Cyclone Giselle, with the highest wind speed ever clocked in New Zealand (166 mph), drove the Wahine ferry onto Barrett-s Reef. Despite rescue attempts, 51 people perished when the ferry capsized and sank. August 1969 – Hurricane Camille, a category 5 hurricane, came ashore over Gulfport, Mississippi with winds of 180 mph and a record storm surge of more than 24 feet. The combination of winds, surges, and rain killed more than 250 people and caused almost 1.5 billion dollars in damage. The National Oceanic and Atmospheric Administration (NOAA), and the National Hurricane Center (NHC) are formed. The first barotropic hurricane computer forecast model, SANBAR, is put into operation at NHC. Project STORMFURY carries out its last experiment when it seeds Hurricane Ginger. The Saffir-Simpson scale, a 1 to 5 rating based upon hurricane intensity, is created. August 1970 – Hurricane Celia, a category 3 hurricane, hit the Corpus Christi area with winds as high as 180 mph. Eleven people were killed, 466 were injured, and the damage is recorded as 453 billion dollars. November 1970 – Tropical cyclone Bhola crashed into Bangladesh with 190 mph winds and a storm surge of 20 feet. The official death toll was put at 500,000 with another 100,000 missing. This is one of the deadliest natural disasters in modern times. June 1972 – Hurricane Agnes hits the Florida panhandle, moves into Georgia and heads north to New York. Although a minimal category 1 hurricane, the widespread severe flooding from Virginia northward to New York caused 2.1 billion dollars in damage and killed 122 people. September 1974 – Hurricane Fifi kills as many as 10,000 people in Honduras, destroying 80 percent of the banana crop and drowning two-fifths of the country-s cattle. December 1974 – Cyclone Tracy, equivalent to a category 5 storm, hits Darwin, Australia causing 837 million dollars in damage, destroying more than 70% of Darwin-s buildings and transportation infrastructure, leaving 20,000 people homeless, and killing 71. September 1975 – Hurricane Eloise, a category 3 hurricane, produces a storm surge as high as 16 feet along the Florida Coast causing about 1 billion dollars in damage and killing 21 people. November 1977 – A tropical cyclone hits the Andhra Pradesh coastline in India killing over 10,000 people, leaving hundreds of thousands homeless, and destroying almost half of India-s food grains. September 1979 – Hurricane David, a powerful category 5 hurricane, rips through the Caribbean before striking the coast of Georgia, and producing tornadoes as far away as Long Island. Damage was estimated at 320 million dollars. Two-thousand people lost their lives to this storm. September 1979 – Hurricane Frederick slammed into the Mobile Bay in Alabama after gaining strength while over Hispanola and Cuba, causing 3.5 billion dollars in damage. Project STORMFURY is officially ended.- The first Synoptic Flow experiment is flown around Hurricane Debby to help define the large scale atmospheric winds that steer the storm. 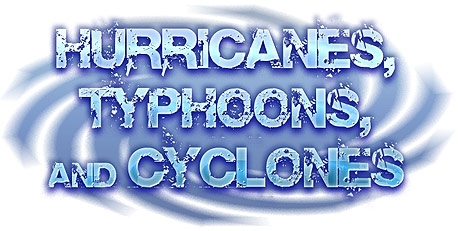 William Gray and his team issue the first hurricane seasonal forecast. The Air Force disbands its Pacific Typhoon Chasers squadrons. The Beta and Advection Model (BAM), and VICBAR, a nested barotropic hurricane track forecast model, become operational. August 1980 – Hurricane Allen, a category 5 hurricane, is ranked as one of the strongest storms ever recorded in the Atlantic. Allen’s eye didn’t touch land from the time it crossed the Windward Islands, including St. Lucia, until it came ashore near Port Mansfield, Texas. Allen caused 2.6 billion dollars and killed 274 people. August 1983 – Hurricane Alicia, a category 3 hurricane, hammered Galveston and Houston, causing 2 billion dollars in damage and killing 21 people. September 1985 – Hurricane Elena, a category 3 hurricane, smashes into Biloxi Mississippi causing 1.25 billion dollars in damage. September 1987 – Hurricane Gloria, a category 3 hurricane, made landfall on the coast of North Carolina before moving northward up the East Coast, causing 900 million dollars in damage. September 1988 – Hurricane Gilbert, the second most powerful storm ever recorded in the Atlantic, hits the Yucatan before proceeding through the Gulf of Mexico and crashing into Matamoras, Mexico. Gilbert caused 5 billion dollars in damage and killed 318 people. September 1989 – Hurricane Hugo, a category 5 hurricane, carved its path from the Caribbean until it made a direct hit on Charleston, South Carolina. Its 20 foot storm surge and 160 mph winds caused an estimated 7 billion dollars in damage, and claimed 50 lives in the United States, the Caribbean, and the U.S. Virgin Islands. Rapid scan high-resolution satellite loops are made of Hurricane Luis, showing eye structure and motion. High resolution dropsondes are released in the eye of Hurricane Guillermo in the eastern Pacific. These reveal wind structure that surprise scientists. NOAA’s GIV high altitude jet becomes operational, allowing examination of the steering flow around hurricanes from a greater height. April 1991 – A category 5 Bangladesh cyclone kills 138,000 people and leaves as many as 10 million homeless in the Chittagong region. August 1992 – Hurricane Andrew, a category 5 hurricane, devastates South Florida with winds of 165 mph, causing 30 billion dollars in damage and claiming 26 lives in the United States and the Bahamas. September 1992 – Hurricane Iniki, a category 4 hurricane, hits Kauai, Hawaii, causing 1.8 billion dollars in damage and killing 6 people. July 1994 – Tropical Storm Alberto dumps an enormous amount of rain over northwest Florida and southern Georgia leaving 31 people dead and causing 500 million dollars in damage. November 1994 – Hurricane Gordon weaves its erratic path from Honduras, Nicaragua, and Florida before making landfall in North Carolina and turning back on Florida. The storm left 1,145 people dead and caused 400 million dollars in damage. August – October 1995 – With 19 storms on record, this season goes down as the second-busiest storm season on record (2nd to the 21 recorded in 1933).- Of note is Hurricane Opal, a category 3 hurricane that came ashore in Pensacola, Florida causing an estimated 3 billion dollars in damage. August – October 1996 – After the 1995 season, it was thought that 1996 could not be as bad, but as it turns out, it was even worse. Six hurricanes reached a category 3 or higher, causing 4.1 billion dollars in damage and killing 147 people in the United States, Mexico , Central America, and the Caribbean islands. August – October 1997 – A welcome relief from the past two years, 1997 recorded only 3 hurricanes. October 1998 – Hurricane Mitch, a category 5 storm, devastated Honduras and Nicaragua with over 75 inches of rain, causing massive flooding and mudslides. The death toll crept past 12,000 people and damage exceeded 5.5 billion dollars. September 1999 – Hurricane Floyd caused the largest peacetime evacuation in history, with 3 million people fleeing from South Florida to North Carolina. The death toll was nearly 80 people, mostly from the storm-produced floods, and damage is estimated at 6 billion dollars. October 1999 – Tropical cyclone 05B, equivalent to a category 5 storm, hits Orissa, India, bringing with it a 26 foot storm surge. A total of 9,803 people died, 40 were listed as missing, and the damage was recorded at 4.5 billion dollars. A NASA experiment, run in conjunction with NOAA-s Hurricane Field Program, collects detailed data sets on Hurricanes Erin, Gabrielle, Humberto, and Tropical Storm Chantal. A major paper in Science details decadal swings in Atlantic hurricane activity. Mike Black and James Franklin publish a paper on hurricane eye wall wind profiles based on GPS dropsondes. April 2000 – Cyclone Rosita struck Broome, Western Australia as a category 5 storm causing severe damage and subsequent coastal erosion. October 2000 – Hurricane Keith, a category 4 hurricane, strikes Belize City causing 2 million dollars in damage in Belize, Nicaragua, and Honduras. Keith left 24 people dead. June 2001 – Tropical storm Allison dumps 37 inches of rain on Houston, during her five day rampage, causing up to 5 billion dollars in damage, the costliest natural disaster to ever hit Houston. October 2001 – Hurricane Iris hits central Belize with 145 mph winds killing 28 people and causing millions of dollars in damage. November 2001 – Hurricane Michelle, a category 4 hurricane, strikes western Cuba and the Isle of Youth with winds of 135 mph, killing 17 people and causing widespread damage. October 2002 – Hurricane Lili, a category 4 hurricane, kills 14 people and causes widespread damage across the Caribbean and into Louisiana. March 2003 – Tropical Cyclone Erica devastated the South Pacific islands as a category 5 storm leaving at least one person dead. September 2003 – Hurricane Fabian, a category 4 hurricane, is on record as the worst hurricane to strike Bermuda since 1926. Fabian is responsible for 8 deaths and 300 million dollars in damage. September 2003 – Hurricane Isabel was able to stay at the highest level a hurricane can reach for over 30 hours, making it one of the longest lasting category 5 storms on record. Isabel struck North Carolina causing 16 deaths and 3.4 billion dollars in damage. January 2004 – Cyclone Heta, a category 5 tropical cyclone, causes 150 million dollars of damage across Samoa, Tonga, and Niue, and claims two lives. March 2004 – Cyclone Gafilo made landfall on Madagascar as a category 5 storm, killing 350 people, and leaving 300,000 homeless from its extensive damage. August 2004 – Hurricane Charley, a rapidly intensifying category 4 storm, devastated Port Charlotte, Florida, killing 35 people and causing 14 billion dollars in damage. September 2004 – Hurricane Jeanne, a category 3 storm, leaves more than 3,000 dead in Haiti as a result of flooding and mudslides. September 2004 – Hurricane Frances, a category 4 hurricane, moved slowly across the Florida Peninsula for more than 24 hours during Labor Day weekend. Frances forced the evacuation of 2.8 million people, spawned 75 tornadoes, caused 9 billion dollars in damage, and left 49 dead. September 2004 – Category 5 Hurricane Ivan was responsible for 124 deaths throughout the Caribbean and Eastern United States. Damage was estimated at 14.2 billion dollars. July 2005 – Hurricane Dennis, just missing a category 5 strength with 150 mph winds, causes damage up to 2.5 billion dollars and claims 32 lives. Cienfuegos, Cuba bears the brunt of its assault, but Dennis brought heavy wind and rain to Jamaica, the Caymans, and Hispanola, before eventually making landfall near Pensacola Florida. July 2005 – Hurricane Emily, a category 5 storm, claims 64 lives and causes 300 million dollars in damage as it cut its path through Grenada and the Yucatan Peninsula. August 2005 – Hurricane Katrina crosses over Florida as a minimal category 1 hurricane before gaining category 5 strength in the Gulf of Mexico. While gaining her strength, Katrina stuck Buras, Louisiana with 140 mph winds and then near Bay St. Louis, Mississippi with 135 mph winds. Storm surges reached 27 feet and winds as high as 90 mph were felt as far east as Mobile, Alabama, which experienced its worst flooding in 90 years. Waves as high as 48 feet happened offshore in the Gulf of Mexico. Extensive flooding occurred in New Orleans, which was actually spared the brunt of the storm. The death toll is currently at 1,833 with damage of 81 billion dollars. Experts estimate the total cost of the storm could reach 200 billion dollars, making Katrina the costliest hurricane in United States history. September 2005 – Hurricane Stan barely made hurricane status but is worth mention here because its torrential rains in Central America caused flooding and mudslides that claimed the lives of more than 2,000 people, and caused damage estimated at 1.9 billion dollars. October 2005 – Hurricane Wilma was the 4th category 5 hurricane to form in this season, and gradually decreased to a strong category 4 storm before striking Cozumel, Mexico. It moved over southern Florida with category 3 winds. Wilma devastated the east coast of southern Florida. Waves as high as 45 feet battered Havana, Cuba. Wilma claimed the lives of 48 people from Florida to Haiti, causing an estimated damage of 10 billion dollars. March 2006 – Cyclone Larry, a category 4 storm crossed the Queensland coast in Australia causing 1 billion dollars in damage and injuring 200 people. April 2006 – Cyclone Monica, the strongest cyclone ever recorded in the Southern Hemisphere, caused massive flooding in far north Queensland, Australia. April 2006 – Cyclone Mala, equivalent to a category 5 hurricane, struck Myanmar, India, causing severe damage and at least 22 deaths. May 2006 – Chanchu — the strongest typhoon on record to enter the South China Sea in the month of May — triggered houses to collapse and landslides in Guandgong’s Shantou city. The Typhoon was the most powerful storm to strike Communist China. Jun 2007 – Cyclone Gonu was the strongest tropical cyclone on record in the Arabian Sea. At its peek, the storm had winds of 150 MPH. Sept 2007 -Hurricane Felix set two records with help from two other storms. It was the first time two category five Category 5 hurricanes struck land during the same Atlantic hurricane season. Two weeks prior, Hurricane Dean hit Mexico. The other record set was for twin Atlantic and Pacific hurricanes making landfall on the same day. A few hours after Felix came ashore, Hurricane Henriette hit the Baja of Mexico. Oct 2007 – Typhoon Lekima causes floods and landslides in Vietnam killing at least 86 people. Nov 2007 – Cyclone Sidr makes landfall near Bangladesh, with recorded winds of up to 150 mph. At least 3,000 deaths were reported, with officials fearing it could be as many as 10,000. Feb 2008 – Cyclone Ivan hits slams Madagascar killing at least 93 people and affecting over 300,000 others. May 2008 Cyclone Nargis makes landfall in Myanmar (formerly Burma). The storm claimed more than 130,000 lives and left more than 2 million homeless, according to the United Nations. It was the the deadliest natural disaster ever to strike the area. Jun 2008- Typhoon Fengshen developed June 15 and hit China and the Philippines directly, killing at least 1354 people with 41 still missing. Aug 2008-Tropical storm Fay develops Aug 15 and makes its way through the Caribbean, killing a total of 23 people there before moving on to Florida, where it took the lives of another 14. Up to 25 inches of rain was received in some areas of the state. Fay was the first storm on record to hit the same U.S. state on four separate occasions, beating a previous record set in 1994. Aug 2008- Hurricane Gustav developed on Aug 25, and took a total of 125 lives and cost up $20 billion in damage. Aug 2008- Hurricane Hanna formed Aug 28 and killed at least 529 people in Haiti, mainly in the Gonaives area, after battering the region with torrential rain and strong winds for several days. Sept 2008- Hurricane Ike formed on September 1, and is responsible for 145 total deaths. Sixty were reported in the United States, and another 74 in storm-pummeled Haiti, where they had already been struggling with the effects of the previous 3 storms which battered the island nation. A total of more than 550 Haitian people lost their lives in these storms, as many as 1 million have been left homeless, and the entire city of Gonaïves was so severely damaged that the Prime Minister says the city may have to be rebuilt elsewhere. May 2009- Beginning as a disturbance in the Bay of Bengal and eventually strengthening to a Tropical Cyclone, Aila made landfall with wind gusts of up to 75 mph and a huge surge of seawater. At least 330 people were killed with another 8,208 missing. Sept. 23 2009- Tropical storm Ketsana devastated the Philippines with massive flooding, pouring a months worth of rain on the city of Manila in just 12 hours. The current death toll of at least 140 people is expected to rise. The storm has been upgraded to a Typhoon, and is now headed for Vietnam. For the first time in recorded history, 12 hurricanes formed this year in the Atlantic basin without any making landfall in the U.S. This was tied with 1969 for the second-highest number of hurricanes recorded during a season. June 30 – Hurricane Alex, the first Atlantic hurricane of the season, swept across the Gulf of Mexico and made landfall on the Mexican coast. The storm left two people dead, caused widespread flooding, and knocked out power for thousands of homes and businesses in the Monterrey metropolitan region of Nuevo Leon, Mexico. September 17 – Hurricane Karl moved straight through Veracruz, México, causing as many as 22 deaths and forcing 40,000 into shelters. September 23 – Matthew, a tropical storm, did its worst damage after it was downgraded to a tropical depression and moved inland across northern Guatemala and into southern Mexico, causing torrential rain, flooding, and landslides. Matthew caused 126 deaths near the Yucatan. November 1–7 – Hurricane Tomas caused landslides and heavy flooding in the Caribbean islands, resulting in 41 deaths and $572 million in damage. The storm was responsible for the cause of 1,000 additional deaths due to flooding that resulted in contaminated water in Haiti and initiated the recent cholera outbreak. The 2011 Atlantic hurricane season was one of the most active seasons in recorded history, producing 19 tropical storms, of which 7 became hurricanes. Three of those were major. August 27 – Irene was the first hurricane—and the first major hurricane—of the season, as well as the only one to hit the U.S. this year. It tracked across the Bahamas and then pushed northward into New England, with Vermont and New Jersey hit the hardest. Death toll reached 55; 3 million were without power, and damage estimates were at $7.2 billion. November – Hurricane Katia, the worst hurricane to hit Britain in 15 years, caused thousands to lose power and touched off inland flooding. August 28 – Hurricane Isaac claimed at least two dozen lives in Haiti. It slammed into into Louisiana with winds of 80 mph. The storm moved slowly over the state, creating massive flooding in the New Orleans area. Isaac arrived on the seventh anniversary of Hurricane Katrina. November 2013 – Super Typhoon Haiyan impacts the southern part of Philippines, killing 6300 people. It also destroyed or severely damaged 1.1 million houses, leaving more than four million people homeless. The Most Powerful Super Typhoon of 2014 Hits the Pacific – While there have been several powerful tropical storms this year, Super Typhoon Vongfong in the Western Pacific has strengthened to become the year’s biggest typhoons. With gusts over 300 mph and sustained 155 mph winds, the massive storm is the most intense typhoon to tear its way through any ocean this year. Although it is currently rated at a category 4, it could reach category 5 by tomorrow (Oct. 9) before hitting Japan. Record-Shattering super Typhoon Haiyan Slams Philippines with 235 MPH Winds – In October Japan was hit by Typhoon Phanfone, killing one U.S. airman who was taking photos of the typhoon with two colleagues when they were swept out to sea. The storm also put rescue efforts on hold in September where over 50 people were killed. The number of hurricanes or typhoons that have reached Category 4 or 5 strength in the Northern Hemisphere this year is closing in on a record set just over a decade ago. Following a trio of Category 4 hurricanes at the same time during the final weekend of August, we’ve now seen 15 storms of Category 4 or 5 strength in the Northern Hemisphere so far in 2015. All of the typhoons or hurricanes in 2015 that have maxed out at Category 4 or 5 strength have been in the western, central or eastern Pacific basins. The strongest hurricane in the Atlantic so far this year was Category 3 Danny.